At the 58th Annual Communication (July 16-17, 1913, Ottawa), the Grand Master, M.W. Bro. William David McPherson, KC, reported (1913 Annual Proceedings, p 43) that he had issued a dispensation to form eleven new Lodges, including one for Hazeldean Lodge at Hazeldean but that it had not been instituted. R.W. Bro. John C. Scott, District Deputy Grand Master (DDGM) of Ottawa District No. 16 does not refer to the dispensation for the new Lodge in his District Report. The establishment of this new Lodge was estimated to save at least ten miles for a return trip from this area, west of Ottawa, to Richmond. 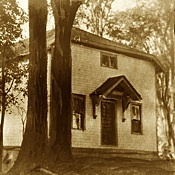 Hazeldean Lodge was instituted by R.W. Bro. Dr. M. H. Steele, District Deputy Grand Master, Ottawa District, on March 5, 1914 (R.W. Bro. Steele was a member of St. John’s Lodge, No. 63, GRC, Carleton Place). There were eighteen Charter Members belonged to Goodwood Lodge, No.159GRC, Richmond: W.Bros. Robert Richardson, J.A. Cummings and Robert Henry Grant (who would serve as DDGM in 1917) and Bros. Albert Bradley, George Green, W. P. Hand, Armour Gracey, Albert Fleming, Albert Argue, A. McCormick, W. H. McGuire, T. H. Mattingly, R. E. Williams, T. A. Hand, T. W. Bice, John Wall, J. E. Steele and George Bradley. The Lodge was subsequently constituted, consecrated and dedicated by R.W. Bro. 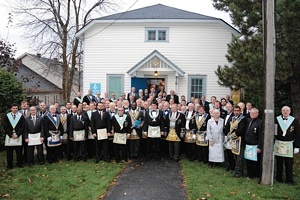 Thomas Shanks, DDGM, Ottawa District as Hazeldean Lodge, No. 517, at which time the first Officers were elected and installed and invested (R.W. Bro. Shanks was a member of Civil Service Lodge, No. 148, GRC, Ottawa). The first candidates were initiated on June 3, 1914 and by December 1914 there were 34 members. By 1942 the roll of the Lodge numbered 60 members (14 Life and 46 Regular Members). Being a rural lodge (in its day) Hazeldean’s meetings were originally held on the Wednesday on or before the full moon from September to June. Elections were held in December, followed by installation in January. Over the years there were many discussions about closing the Lodge during the bad weather months of January/February/March and remaining open throughout the summer. In July 1936 the By-Laws were amended so that the Lodge would call off in February and March when the roads were bad. In 1944 the meeting date was changed to the third Wednesday of every month, election in May and Installation in June. In 1948 approval was given to amend the By-Laws to permit the Lodge to call off in July and August and remain open from September to June. 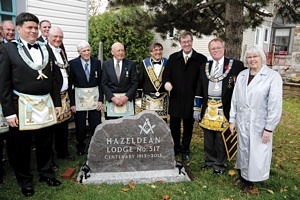 Lodge Dedication The first meetings of Hazeldean Lodge were held in the local Orange Hall until more permanent facilities were available. The Lodge building, which is still in use, was erected during 1914 at a cost of $3,180 — of which $1,060 was for furniture and $150 for lot and legal fees. The Lodge was heated by a wood burning stove and lit by oil lamps for many years as electricity was not installed until 1928 (at a cost of $136), and the installation of an oil furnace waited until 1964. The electrical service was replaced and the building rewired in 1964. When the Metcalfe Street Temple was razed to the ground in 1975, almost two years before the new facility at 2140 Walkley Road was to become available, various Lodges were required to seek a temporary home at Hazeldean: Dalhousie No. 52, Civil Service No. 148, Sidney Albert Luke No. 558, and St. Andrew’s No. 560. With the advent of World War I Dispensations were obtained at various times to permit the second and third degrees to be given in the same night for Lodge members proceeding on active service overseas. In May 1918, all three degrees were conferred on the same candidate in the same evening by Hazeldean, Carleton and Ionic Lodges (each Lodge doing a full degree). By Motion the dues of Lodge members serving on active duty were exempted from payment for the duration of the war. Eight members of the Lodge served the colours during World War I and all survived their service. A similar situation to remit dues of service brethren was passed in 1940 with effect for the duration of World War II. The depression years took their toll on the Lodge and there were often no candidates for initiation. During the 1930’s this led the Lodge to work degrees at other Lodges in the city — Acacia Lodge No. 561, at Westboro, Sydney Albert Luke, No. 558 at the Metcalfe Street Temple, and E. B. Eddy Lodge, No. 41 GRQ, Elk Lake (No. 507) at Elk Lake, Ozias (No. 508) at Brantford, Twin City (No. 509) at Berlin, Parkdale (No. 510) at Toronto, Connaught (No. 511) at West Fort William, Malone (No. 512) at Sutton West, Corinthian (No. 513) at Hamilton, St. Albans (No. 514) at Toronto, Reba (No. 515) Brantford, Enterprise (No. 516) at Beachburg and Hazeldean (No. 517) at Hazeldean. In 1931 a Committee was formed to collect arrears of dues and by November 1934, the minutes show that the Lodge moved to carry members in arrears indefinitely. In good years the Lodge welcomed degree work for its members put on by various groups including the RCMP , Bell Telephone and RCAF Degree Teams. Picnics were an early form of Lodge social activity and began as early as 1920 as a way to raise funds to pay off the Lodge mortgage. The first reference to a social evening in the Lodge History is shown for November 14, 1928. The first reference to attendance at a District Divine Service (held in South march) appears in 1931. The first reference to a Ladies’ Night (an “At Home and ladies’ Night”) appears in the February 1959 minutes. A Benevolent Fund and a Building Fund were started in 1961. Honourary Life Membership was granted on occasion until 1958 when the Lodge agreed that any member who had paid dues for 15 years to the Lodge could become a Life Member on the payment of any fees required by Grand Lodge.